VietPress USA (June 14, 2018): Today on Thursday, June 14, 2018, North Korean State TV broadcasted a featured news report of 42 minute-long program captured on last Tuesday summit between President Trump and North Korean Leader Kim Jong-un in Singapore on June 12, 2018. North Korean intends to publish the image of President Donald Trump as U.S. General Commander standing straight and uses his right hand to salute a North Korean General at the witness of Kim Jong-un. Trump had many times criticized former President Barack Obama for bowing down to salute Japanese King and Saudi Arabian King. 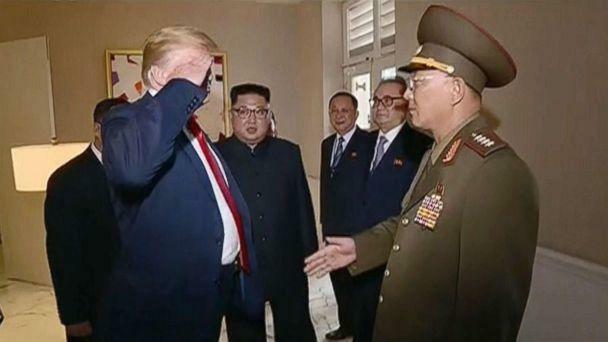 U.S. President Donald Trump saluted a North Korean general in an awkward moment captured on video and broadcast by North Korean state media Thursday. The brief interaction was featured in a 42-minute-long program about Tuesday's unprecedented summit between Trump and North Korean leader Kim Jong Un. 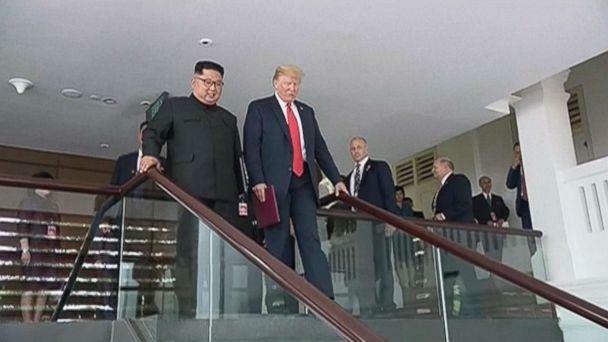 The program, narrated by North Korea's most famous newscaster, Ri Chun-hee, aired on state-run television two days after the summit in Singapore and a full day after Kim returned home to his country's capital, Pyongyang. The footage also offered a rare, behind-the-scenes look at Kim's trip, including his arrival in Singapore on a chartered Air China flight and his motorcade driving past what appeared to be a warm welcome from throngs of people crammed on the streets. North Korean viewers had to wait almost 20 minutes into the program for Trump's first appearance. The video included the lengthy handshake between the two leaders, which took place before their one-on-one meeting at the luxury Capella Hotel on Singapore's Sentosa Island. 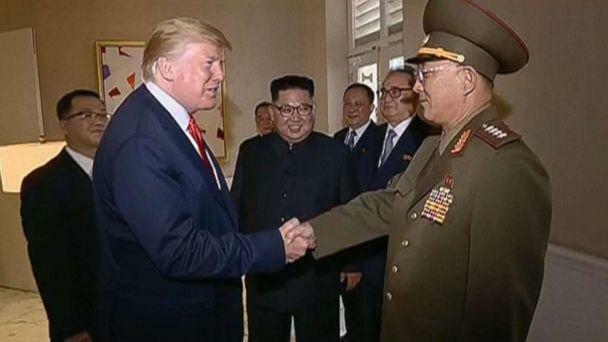 The summit was the first time a sitting U.S. president met face to face with a North Korean leader. On the agenda were North Korea’s illicit nuclear weapons program and a potential deal to denuclearize the country. The carefully-crafted program repeatedly showed North Korea's supreme leader smiling and depicted him as polite, confident and completely in control. Kim has ruled with an iron fist since 2011 when he assumed power following his father's death. All media in North Korea is controlled by the state and so the program's entirely positive view of Kim, the summit, and its results come as no surprise.